This week, We're going to walk through the process of creating your own custom Platinum Notes template. Creating custom templates allow you to craft the sound of your set list, to fit the sound system of the venue you are playing. With Platinum Notes, you can even set up a template to automatically Master your own tracks, but that's for another tutorial. 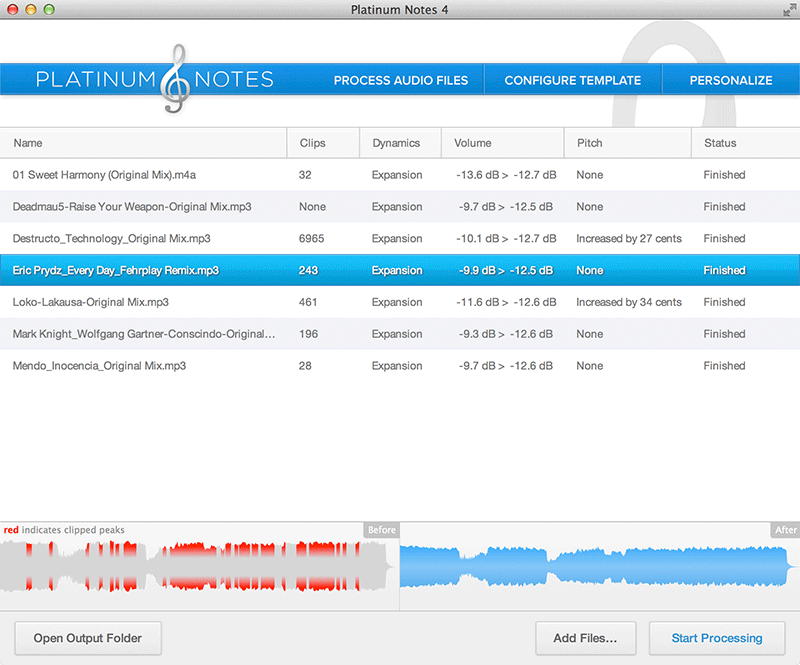 The first thing we will want to do is create a duplicate of one of the included official Platinum Notes templates. To do this, Just click on the small gear icon and select "Save as". A small window will then pop up and you will be given a chance to name your new Template. Once saved, all advanced parameters should be available for editing. Here you can set the overall volume of your setlist in dB and change how aggressively the limiter effects the tracks in your collection. This way, you can free your hands from the gain knob and keep them free for more creative tasks. Some tracks in today's popular music have fallen victim to what is known as the Loudness Wars resulting in over compressed audio and clipped peaks resulting in distortion. You may not notice on your home stereo, but they become painfully obvious on large systems that you find in clubs or at festivals. This section allows you to enable and disable Clipped peak correction, and decide the max dB and volume levels you want your track's peaks to reach. You can also add a little extra headroom in your track to prevent clipped peaks in the future if you get a little too aggressive with your mixer's gain knob. When Mastering a track, many Mastering Engineers will bounce their audio to Analog Tape, and then back again to a digital format. doing this adds a bit of analog warmth and fullness to digital audio. Platinum Notes can actually replicate this process and gives you two options for the type of warmth added to your track: Gentle or tube style. This works great for old cassette and vinyl rips who's audio have become warped with time. Here you can toggle pitch correction on and off and adjust the aggressiveness of your pitch correction. You can also choose the type of correction that takes place. You can either change the pitch while keeping the tempo locked in place, or you can change the tempo with the pitch, much like a tempo slider on a DJ mixer. Tweaking these advanced parameters can open up all kinds of possibilities and in the long run, could end up saving your set. If you like our Platinum Notes tips, please like, react, and share on Facebook and let us know how you set up your custom templates.